Battle for Azeroth’s portly new Kul Tirans add variety, realism, and relatability to the undying MMORPG. Every so often I get the urge to travel to the Caverns of Time dungeon in World of Warcraft and behold one of the game’s rarest creatures. It’s not a dragon or another friggin’ elf—oh, no. Instead, this once-endangered species is a portly human mage who ambles down shady lanes in the Hillsbrad Foothills. So far as anyone knew, he was the only fat human in the game for at least a decade, and damn if he didn’t make a potbelly look good. He carried himself with the poise of a king. He didn’t give a flip what you thought of his paunch-friendly shirt. In a world where even walking corpses look as though they could model for Cosmo, he reminded me that not all heroes hate crèpes. 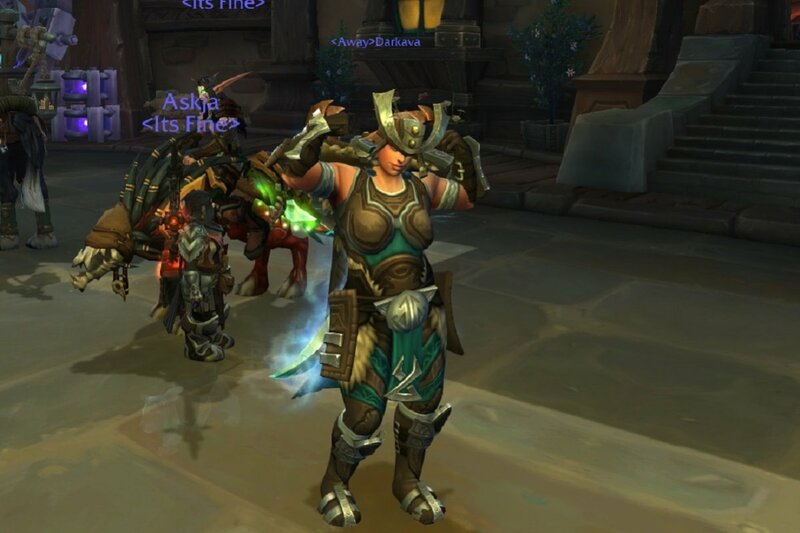 Blizzard wasn’t yet ready to attempt the same look with women. And these days he’s in good company. 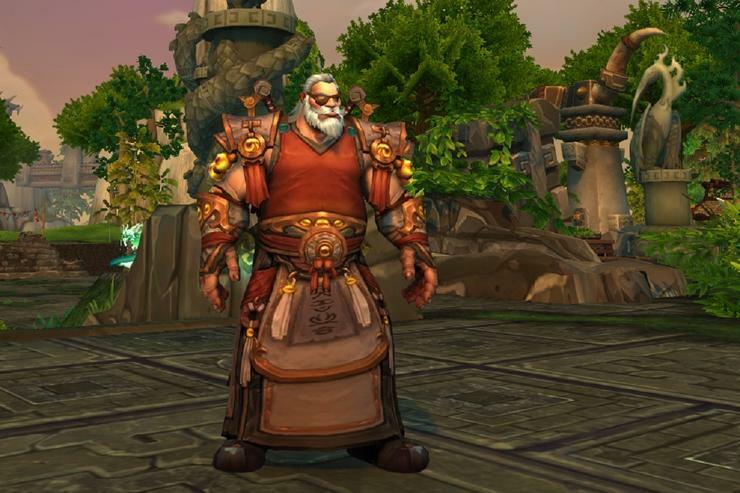 The current Battle for Azeroth expansion introduced portly NPC human men and women in the form of Kul Tiran islanders last year, and just last Tuesday Blizzard dropped a patch that let Alliance players play as Kul Tirans ourselves. (The Horde got Zandalari Trolls.) The women are “thicc,” as the kids like to say these days, and the dudes walk around with a belly that looks as though it was nurtured on copious servings of fish ’n’ chips and ale. The Internet being the Internet, though, naturally people started griping about the “fat humans” the second they appeared last year. At times, the hate dripped like fat from a grilling steak. I amused myself by reading this as, “Why did we get fat, humans?” And now you can, too. But me? I’m a fan. In fact, the first thing I did when I unlocked them on Tuesday was slap down the $17 (with discount) needed to change my Monk into one. I love how Kul Tirans are tough despite their bulk. I delight in their accents and how their work brings them in constant contact with the elements. They remind me of the rancher folk I grew up with: men and women who feast heavily on BBQ and burritos but who smile through hurricanes and carry injured cattle with the ease that some folks carry their groceries. More to the point, well, they remind me of me. I wish the men had more face options besides “grumpy with beard” and “grumpy with scar,” but I’ve managed to make one I can live with for years. The plumpness comes with prestige. Kul Tirans are an “allied race,” and in this case it means that you can only unlock them if you’ve completed most of Battle for Azeroth’s storyline, and spent a few weeks grinding world quests in order to reach exalted with the Proudmoore Admiralty faction. This isn’t as hard as it sounds if you’re playing World of Warcraft enough to justify paying the subscription, but the fact remains that if you’re playing a Kul Tiran, you made a determined effort to do so. Yeah, Blizzard’s definitely not going for “pretty” here. I did, in part because I like how Kul Tirans imply I don’t have to look like a stereotypical model in order to be good at what I do. I like this message, as I’ve struggled with my self-image for years and remain self-conscious about my twangy accent (although I’m too proud to lose it). Shockingly, Blizzard apparently managed to craft an entire expansion partly around them without making a single fat joke. It’s a reminder that I can have a funky accent and a BMI that makes vegans wince and still be a hero. Media implies the opposite every day. Some of the best cowboys I knew as a kid were too plump to ever be played by the likes of Heath Ledger, and I myself sported a Kul Tiran gut for much of the time on horseback as a teen as well. This is all important, especially in an age when representation occupies a big part of the online discussion. I know it personally enhances my own experience. Part of the reason why I still play WoW in the first place is that I know I’m good at my healing role and I thrive on the positive feedback I get when I do a good job. After 15 years, I see my character as an extension of myself. When I played as a human, at least, I could only perform those roles while looking something like the typically unattainable ideal of a human, regardless of whether I played as a man or a woman. 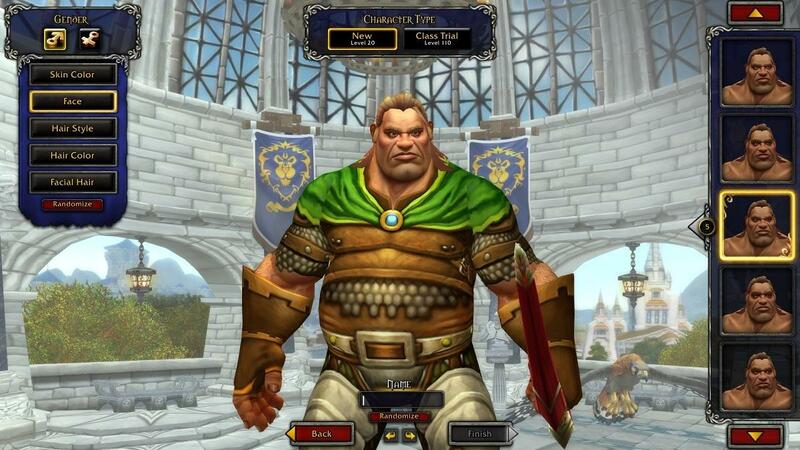 But Kul Tirans allow me to play a human with a more accurate representation of myself, gut and all. Can we all agree that it’s ridiculous that some people think this is too flabby for women? 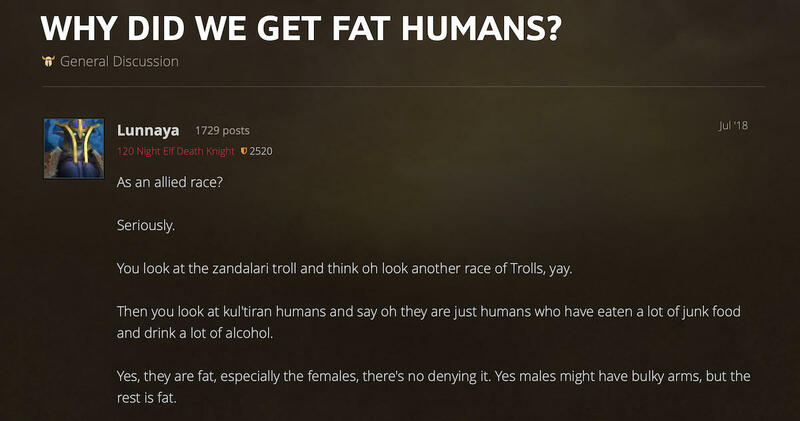 The lightweight backlash amuses me in part because both Horde and Alliance have had an even fatter race for years in the form of the Pandaren. I should know. Up until Tuesday, I played one. 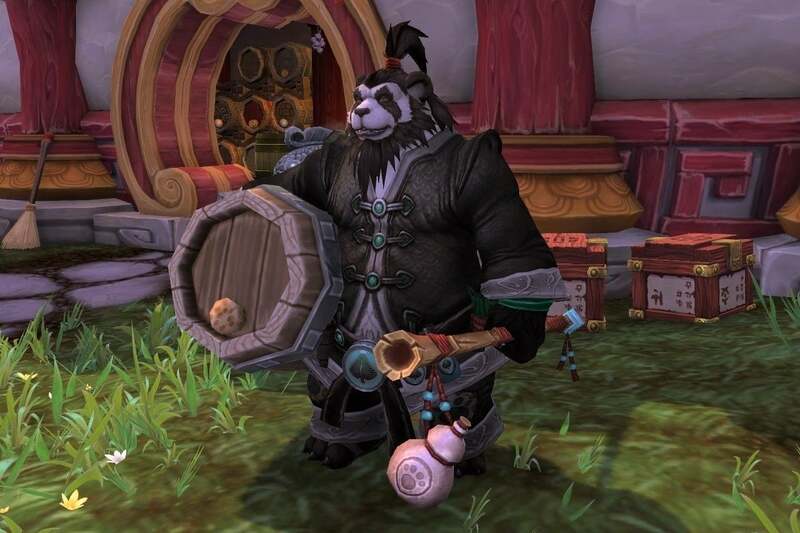 None of WoW’s other races felt so “me” as the Pandaren—and that includes the Kul Tirans. They love good food and nature in equal measure and yet still manage to stand up for what they believe is right when necessary. Behold, one of Azeroth’s most famous heroes. I’ve used the word “portly” for Kul Tirans, but male pandas are flat-out fat. People would slam me with garbage that I’ve yet to see as a Kul Tiran. I’d be questing alone in 2016’s Legion expansion and people would come up to me and say, “Hey, fatty, go away: no one wants you around here.” I’d get kicked from groups just because I was a male panda, especially when they saw I was from the Moon Guard server. (We have a…reputation for stuff that goes on in the human starting town of Goldshire, but that’s another story.) Even when pandas basically vanished from the player rosters, I continued to play one. I can’t deny I got some glee out of it, particularly when I’d clobber some wispy Blood Elf in PvP and think to myself, “Yeah, that’s right. You just got owned! By a panda! From Moon Guard!” Talk about empowering. After all that, playing a Kul Tiran feels a bit like giving in to peer pressure. Even so, I love how the community has embraced the Kul Tirans with a zeal that the pandas never enjoyed. Witness this chap, who made one that looks like Mario astride Yoshi. Check out these guys, who look like the gang from The Princess Bride. Just in time for the last season of Game of Thrones, there’s even a King Robert Baratheon. And then you’ve got, well, whatever this guy is. Well, it is a fantasy game. Battle for Azeroth has more than a few problems, but as I said in my review, its greatest asset is its world. With Kul Tiras, Blizzard stepped away a bit from the pure high fantasy with the existing humans and gave us a landscape and a people that feel as real and varied as the one we occupy. Thin Kul Tiran NPCs patrol the streets alongside their paunchy pals. Stately mansions loom above ramshackle slums; the streets’ cobblestones smeared with a liquid that may or may not feel saltwater. 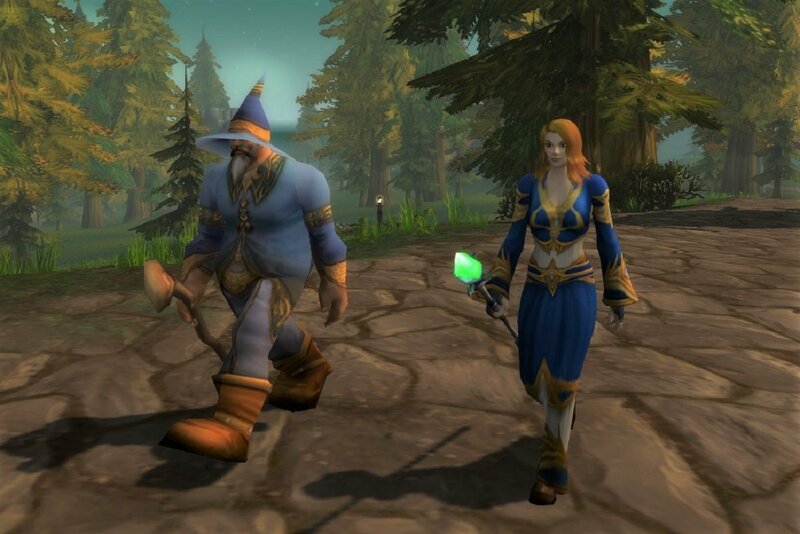 For better or for worse, World of Warcraft has never felt more real. We got a taste of that with the Kul Tiran NPCs, but Blizzard did us a favor by letting us play them as well. It’s possible I won’t resemble the Kul Tirans for much longer. The pounds are dropping off again, and the basketball I lug around under my shirt is finally beginning to deflate. But when that moment comes, I think I may keep playing as a Kul Tiran, after all. My hefty dude is a reminder of where I’ve come from; an acknowledgment that appearance doesn’t neatly translate into ability. And much like that flamboyant, fleshy wizard in the Caverns of Time, I’ll have an attitude ready for anyone who doesn’t like it: Deal with it.